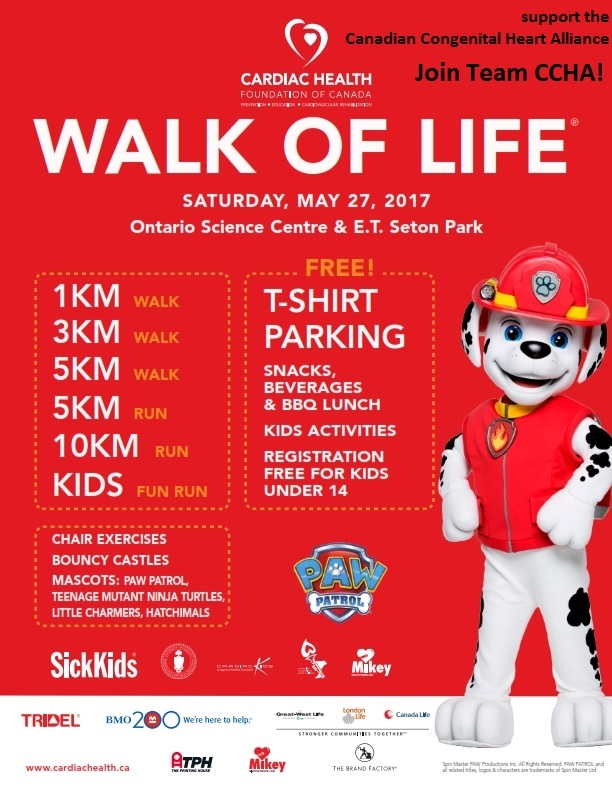 Join Team CCHA on Saturday May 27th to walk or run while raising money for the Canadian Congenital Heart Alliance (CCHA). Come out for fun, exercise, meet other CHD patients and their families and support a worthy cause all the same time! Online registration is now open! Join Team CCHA today. Where: Ontario Science Centre, 770 Don Mills Road & E.T. Seton Park (Sunnybrook Parkland) located in Toronto, Ontario map. Stay for the after party which includes BBQ lunch, run awards, bouncy castles for kids and musical entertainment. medals and give-aways and more. This year marks Team CCHA's 8th year participating in the Walk of Life! Our goal is to raise over $20,000 to support education and awareness programs, camp programs, advance research, and increase the profile of congenital heart disease across Canada. Note: You must be a member of "Team CCHA" in order for the money you raise to go towards the Canadian Congenital Heart Alliance. Team CCHA is the only charity team supporting both children and adults with congenital heart defects and their families across Canada. Funds raised by Team CCHA are split with 66% of the funds raised going to CCHA (the other 33% goes to the Cardiac Foundation of Canada; a charitable organization dedicated to supporting cardiac rehabilitation and the advocacy of prevention and education across Canada. Many of our members with congenital heart defects take advantage of the Cardiac Health Foundation of Canada's cardiac rehabilitation programs to help them exercise safely under supervision, and before and after surgery). Can't make it out the day of the event, you can still help by donating and asking your friends and family to donate as well. Please visit our team page by clicking Team CCHA and select 'General Team Donation'. For more event info please contact Jennifer at fundraising@cchaforlife.org. The host of this event is the Cardiac Health Foundation of Canada, a charitable organization dedicated to supporting cardiac rehabilitation and the advocacy of prevention and education across Canada. Since 1965, $10 Million has been raised nationally for facilities, scholarships and research, patient and public awareness, professional education and medical equipment. Did you have heart surgery as a child? Are you an adult with congenital heart diseases? To find a cardiologist with specialized training in adult congenital heart disease, please read for important info.